Rumah Sakit Umum Pusat Dokter M Djamil Padang – RSUP Dr M Djamil Padang or known as as “RSUP Dr M Djamil” is a major Government-owned hospital in Padang West Sumatara. RSUP RSUP Dr M Djamil is the Class A Hospital and has a functions as a referral hospital for the region of Central Sumatera. RSUP Dr M DJamil operates directly under the Government of Indonesia through the Directorate General of Health Effort Care of the Ministry of Health Republic of Indonesia. RSUP Dr M Djamil has legal domicile in Jl Perintis Kemerdekaan Padang. 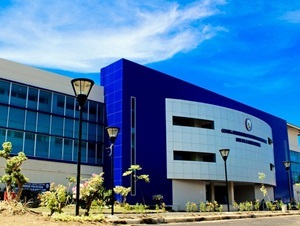 According to information found in the Hospital’s website as cited by JobsCDC.com, RSUP Dr M Djamil was first established in 1953 and initially registered as Rumah Sakit Umum Megawati (RSU Megawati). The name of RSUP Dr M Djamil was officially launched in 1978. The name of this hospital is taken from dr. Mohammad Djamil, one of the doctors, lecturers, and governors who had served in the province of Central Sumatra. Maximum age of 35 years old on 30 June 2018. Minimum height of 160 cm for Male and 155 cm for Female. Minimum education accreditation B by attaching a copy of the accreditation certificate. Have a high motivation to work, energetic, creative and able to work together with the team. Willing to work three shifts. Willing to work as a Non-Civil Servant Specific Time RSUP Dr M Djamil Padang and do not demand to be appointed as CPNS (Candidates for Civil Servants) and Permanent Employee of Dr M Djamil Padang. Able to operate the computer. Not in the condition of pregnant and willing not to get pregnant within the first year of duty in RSUP Dr M Djamil Padang (for Female) by attaching stamped statement. Certificate of PPGD and / or BTCLS. Certificate of PPI Workshop / Certificate of Patient Safety Workshop. 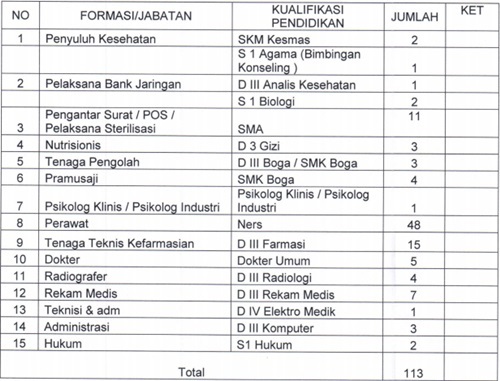 Preferably Male especially for formation of Tenaga Pengolah Makanan, Tenaga Radiografer and Dokter Umum.